"The World's Best Selling Padlock!" - Combination: Combination Alike (1500KA). - Special Ordering: See below for Special Order information (i.e., ordering padlocks matched to existing combination number). - Delivery: The Master Lock 1500KA Combination Padlock is in stock and available to ship. The world's highest-selling combination lock is available at the best price online and ready to ship. Master Lock's 1500 series padlocks are the choice of schools and institutions across the country and the globe. 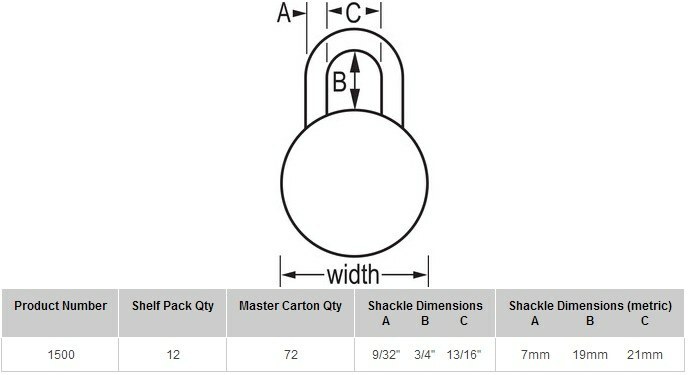 The 3-digit combination mechanism has over 64,000 possible combinations, and the 7mm shackle fits all standard lockers. The 1500 is a box pack with serial numbers provided. The 1500D comes as individually carded (Individual Blister Pack) and not available with serial numbers. Speical Ordering: If you require the No. 1500KA Padlock matched to a specific serial number or combination number please leave a note in the Comments Box upon checkout (you can also immediately reply to the Confirmation E-mail with special order instructions).